I have an attraction to oddball calibers and one I am interested in right now is the .30 Remington AR. Does anyone know who might still be selling upper assemblies in .30RAR? All my search results are just pulling in generic 5.56mm uppers which I have aplenty. It is my *understanding* that it will be RE-introduced in 2014. It was dead on arrival, and although a good cartridge, it didn't fill the niche, and the truth is, small bolt diameter with BIGGER bolt face in an AR proves to be problematic. Lugs break and the lip all the way around is smaller, which has been a headache for cartridges like the 6.8 and .450 BM. If they do reintroduce it, the ammo will also become more available, but were I wanting to go .30 cal and not do Blackout, I would got with a 10 frame and go .308. As boring as that sounds....however new exciting cartridges will be out in 2014 for the 10 platform. ....however new exciting cartridges will be out in 2014 for the 10 platform. You do not have to make cases. MidwayUSA is selling factory .30RAR ammo right now. I can say I learned something today....never even knew anything about a .30AR round. Just started hearing and learning about the .300 black out.....another round for the AR platform. I guess nothing ever gets better until somebody tries it? That said, what do you consider the advantage would be other than a larger dia bullet? My tendency is to stick with tried and true, readily available, components around and respond well to reloading. what do you consider the advantage would be other than a larger dia bullet? Details of things to come ??? Just an observation.....on new and improved. I will qualify it with the statement, I don't reload, .30-06 or .308, actually don't even own a .308. These comments are made from experience hanging out with friends that do.....and not intended to start the debate...I won't participate. As the 30-06 has been around forever, has been loaded and re-loaded with every thing for cat sneeze loads to bigazz heavy bullets all seem to work pretty well, with some tweaking. Now on the other hand the .308 was engineered later in the century with all sorts of design perimeters for the most efficient use of size powder load, and all the ballistics that go with it. I look at a lot of the new rounds as attempts at refining a load for a specific use, bigger bullet cross section, mass, subsonic.....plug in a use. So as most every re-loader has a built in desire to Make it better.....LOL. The new offerings seem to be the industry it self trying to come up with the new ideal load, and of course with the popularity of the AR platform....and make'em fit. So I applaud those that continue the quest, the factories for coming out with the new stuff....and those that plunk down their bucks to try them out. It is cool to be the first one at the range to have one......be it a new whizzbang, or a obsolete round that no one has ever heard or seen. I am a hunter, and don't care to spend a whole afternoon, blasting away with a big bore rifle, or even pistol....I find some thing that works to put meat on the table, and stick with it....with the knowledge I can fill it up again and is as good or better than purchased. Anyway keep us posted on results. The cartrigde- 30 AR- is an ok cartridge, .30 cal performance with higher velocities, makes it a good hunting round. The fact it is an AR is what makes it potentially appealing. You can have an AR with a .223 upper, a .30AR so forth and so on. Remember- ARs are semi auto contenders... .22LR up to .50 Beowulf.... It is a good cartridge- for an AR. Everyone told me when I was building Grendels in bolt rifles - Why? You can get a .260 or a 6.5-your choice. HOWever there is an appeal to having companion firearms, different platform same ammo. i.e. .38 revolver, .38 lever gun. The .300 Blackout. I started making them before other companies did on a micro scale because no one could get them but everyone wanted them- and I could. It is a .300 Whisper with a touch more freebore and a slight difference in throat angle. Essentially the same difference as 5.56 and .223. BUT the change in the chamber drawing bypassed JD Jones' Whisper which was protected by Copyright and expensive. Because it was pioneered by AAC- Why? So they could sell more suppressors. Fantastic little cartridge, necked up .223 - .30 cal. Surpasses 7.62x39 with supersonic loads and supresses easily with 220 gr .30 cal bullets. PLUS it feeds out of a standard .30 cal mag. Lot of neat stuff out there, got to make the decision on what you want and what you are going to do with it. HINT- one new cartridge being introduced in 14 will be a big bore round on a .308 platform that flat OUT puts a real world hurting on anything... it is fantastic. Other things to come I will update after Jan on the other stuff. Another question....... What is the linage of the 450 Bushmaster ?? Kind of a version of the old 458 x 1 1/2 that will work in an AR ?? Now we are getting done to some interesting stuff...........Do tell. the .338 in the .308 case? Again? This is a how-to, homesteading and self-reliance website and Forum. We want to attract people who are primarily interested in those areas and for whom politics is secondary. Here's an internet truth; just because it bothers you, doesn't mean anyone else cares! - Me. And in a few years when the idea flops you'll be stuck with a gun and or components that you'll have to pay someone to remove from your hands. I say stick with the tried and true! That's kinda my view as well. I do have a .225 win...that is an odd ball these days...was beat out back when, by the .22-250. As its a custom built rifle with a custom barrel on a Mauser '98 action, I went through the trouble of hunting down ammo, brass, dies etc........but tend to avoid spending my money till I know it works. I mean come on, this is just mean. Just say it! Is it an autoloading .358 Winchester for the AR ten platform? If they make an LR-308 version, I'd buy that. Then I'd have a rifle that I could shoot the .358" bullets I discovered I can make out off scrap .223 cases. I really don't NEED a .30RAR. I already have a LR-308 to get me in trouble. It's just that stripped AR-15 lowers were at lowest price I've ever seen on Black Friday, so I ordered a couple. Now I have to whip something up. I just can't leave a lower stripped in front of everyone. It's indecent! Well, I could start with the .450 Bushmaster, another cartridge on my short list. I can also make .452" jacketed bullets. With the present ammo availability situation I remember a conversation I had with Federal Engineers at Camp Perry back on 90s. They told me they load more 30.06 than all other center fire cartridges put together. Think about it, 30.06 ammo is easiest to find. The most prevalent round was of course 22LR. 06 is hard to beat as you can load from 110 gr. to 240 grain bullets for them and shoot cast bullets as well. Well, I finally found one. Had it shipped from Utah, after having a second company make it California compliant. It's A Remington AR15 in 30Rem AR. 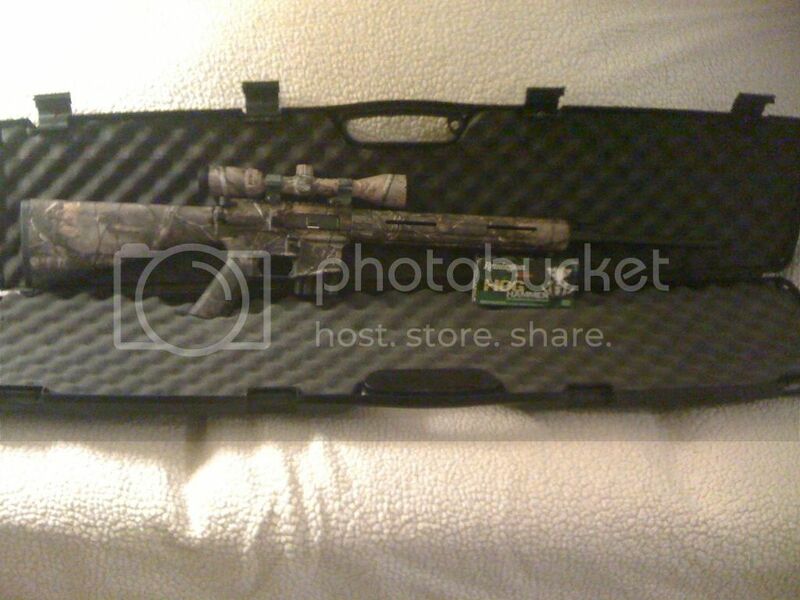 It has a 22" barrel and I put on a 3X9 Bushnell realtree scope. Spray painted the scope mounts with tan and green paint to somewhat camo them. Will get it out to the range after the weather warms ups some more. Will do the initial sight-in with Remington FMJs, then the final sight-in with lead-free Hog Hammers. A friend near my rock pile inherited his father-in-laws old Remington 1906 style auto loader in 30 Remington cal.. The 1906 version of the cartridge series from then to include the 35 Remington still used today..
All times are GMT -2. The time now is 11:01 AM.